Beethoven, Ludwig van, 1770-1827. Trios, piano, strings, op. 97, B♭ major. Andante cantabile (Sketches) . Sketches for the variation movement of the Piano trio in B♭, op. 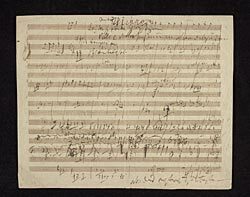 97: autograph manuscript, 1810 or 1811.